Criticism of Google has widely been known for misuse and manipulation of search results including censorship of information and content, but wiping out the google cache of controversial pages takes it to another level. It’s no longer safe to post any link from google cache thinking it will be there at anytime in the future. 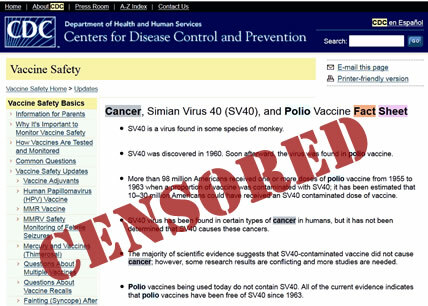 I’ve never seen this happen, but because NaturalNews reported on my article sourcing realfarmacy which contained my original report on PreventDisease, Google has wiped out the cache link stored on their servers regarding how the CDC Admitted that 98 million americans received polio vaccine in an 8-Year span when it was contaminated with a cancer virus. I’ve since updated the article, but encourage all those who reposted the article including realfarmacy and NaturalNews to please refresh your links as well to bypass yet another attempt to censor critical information on the internet. Thanks to all the web traffic, it looks the flood of user requests on this cached page flagged Google’s proficient censorship team who jumped on the opportunity to delete the page to prevent further views. Google employs web caches to store billions of web pages and images to reduce the amount of information that needs to be transmitted across their network, as information previously stored in the cache can often be re-used. It also serves as an archive tool to track web pages that have been deleted. The way back machine is another archive tool with similar technology. If you click on the cached here link above, the cached information has now been removed and a 404 error now pops up. So not only did the CDC remove their own page, but Google then subsequently removed the recorded cache of that page…hmmm. I have now edited the paragraph to include a permanent link of screen snapshot of the cached page which I have been advised will never be removed at least on PreventDisease. The link to the snapshot can be found here. If you prefer not to link to the PreventDisease image of the cache, you can also for now (and I emphasize “for now”), access the cached page on the way back machine. To all those who reposted the information, please update your text and links accordingly. We wouldn’t want Google to think that there little cleansing policies don’t go unnoticed. Thank you all for speading this information far and wide and for making it accessible to millions of readers.